Although there are other options for supplementing the diet, for many people it comes down to soy protein vs whey protein. Is one better than the other? Whey protein, the most popular protein supplement, is made from milk byproducts. It is a complete protein, and it contains both essential and non-essential amino acids as well as the branched chain amino acids (BCAA), which make up much of muscle protein. 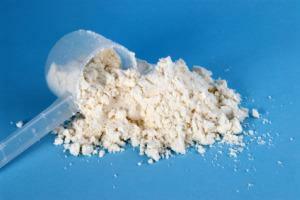 Whey protein powders may be labeled as concentrate or isolate. Concentrate may be anywhere from 25 to 89 percent protein, while whey isolate is of higher quality and is more than 90 percent protein. However, whey isolate is also more expensive. Whey protein has a more neutral taste compared to soy protein and does not contain isoflavones or phytoestrogens. Whey protein is also higher in most of the essential amino acids than soy protein. Whey protein is known to help boost immunity and fight infections. It appears to slow the production of cortisol and may increase the secretion of serotonin, which reduces stress and depression. Whey protein slows the absorption of glucose in the bloodstream, which may aid in weight loss as well as help manage blood sugar levels. Whey protein powder is not appropriate for anyone who has a milk allergy or is lactose intolerant. It is suitable for vegetarians who include dairy products in their diet but not for vegans. Soy protein is obtained from soy flour. It is the most complete of the vegetable proteins, but it is not a complete protein, since it does not contain the essential amino acid methionine. Like whey protein, it comes in either a concentrate or an isolate form, with the isolate being a purer protein. Soy is known to lower LDL cholesterol and triglyceride levels in the blood and reduces the risk of heart disease. Although studies are still ongoing, there are also indications that soy protein may have an anti-carcinogenic effect. Soy protein has been linked with increased bone health. High-protein diets have been implicated in a higher-than-normal loss of calcium in the urine, which increases the risk of osteoporosis, but studies tend to show a lower loss of calcium with soy protein when compared to animal proteins. High-protein diets are also known to place stress on the kidneys, but soy protein is filtered more easily by the kidneys than animal proteins. Soy protein isolate may also have an advantage when it comes to weight loss. For most people, it increases the production of thyroid hormones that regulate metabolism and may help prevent the lower metabolism that sometimes results from low-calorie diets. It is a good choice for people with milk allergies, and it is suitable for vegans. Once you've weighed the pros and cons of both types of protein powder, then it's time for the big decision. In the battle of soy protein vs whey protein, which one is the winner? When it comes right down to it, they both are. For every argument that can be made for or against whey, there is a counter argument on the soy side of the equation, and there are few clear-cut answers either way. Unless you are vegan or have an allergy to one product or the other, then the best choice is whichever one you prefer for taste and that fits within your budget.